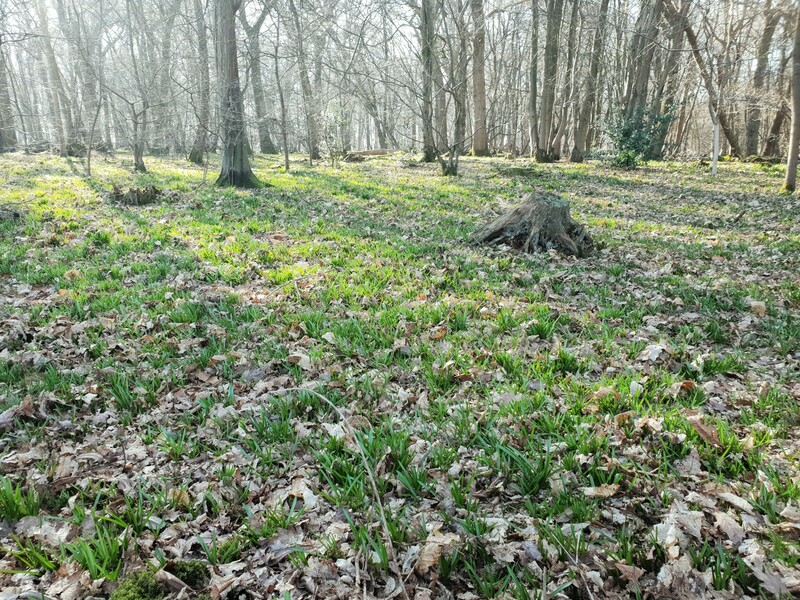 This photo shows how quickly the bluebell leaves are appearing, which is no surprise considering for some days we have been experiencing such hot weather. February 2019 is now an official record-breaking month, with day time temperatures over twice what we should expect for this time of the year. So how will the plants, insects, birds and mammals cope and adapt? These fluctuations in temperatures now unfortunately appear to be regular aberrations, in what we used to rely on as the monthly norms! We have to select the dates we open in November, allowing time for the 23 charities to ensure their volunteers will be free on the dates they are on duty. This then gives us time to have our leaflets distributed early in the New Year as many magazines have a long lead time before publication. Also groups need to confirm their coach bookings. If the dates we have chosen this year, namely 11 April to 19 May work out, it will be just pure luck! In 2018 due to ‘the beast from the east’ in hindsight we opened one week too early! What our visitors never see! 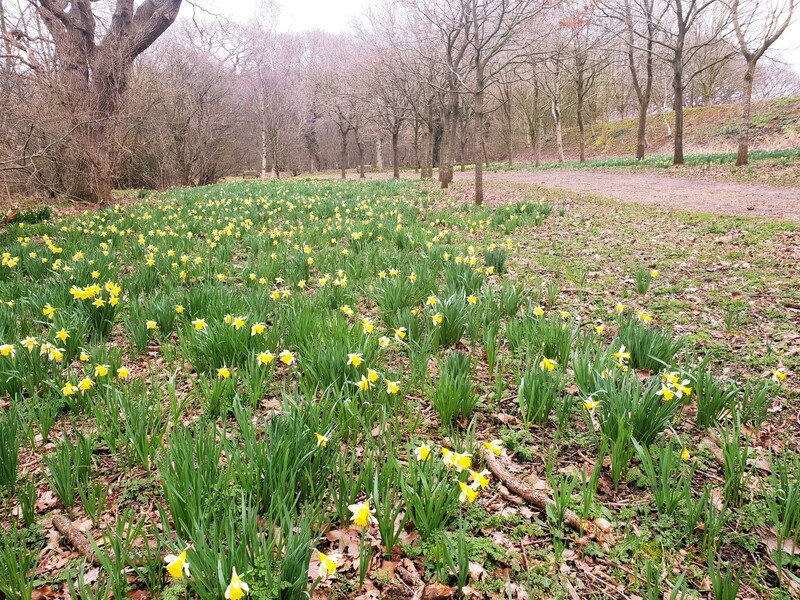 This image of the wild daffodils now flowering alongside the Millennium Avenue, is a view that precedes the emergence of those vistas of white wood anemones followed by the bluebells. The removal of shading from adjoining trees now gives them ample light to grow to their full potential and increase in numbers. Soon after the oaks that form this Avenue were planted, my wife harvested seed from a small patch of Narcissus pseudonarcissus we had in the garden. This seed takes five years to produce flowering heads, so year on year we have seen steady increase in the area they cover and their appearance heralds that spring is nigh. This year we have taken the first step towards making our Bluebell Barn warmer on cold days and cooler on hot days! 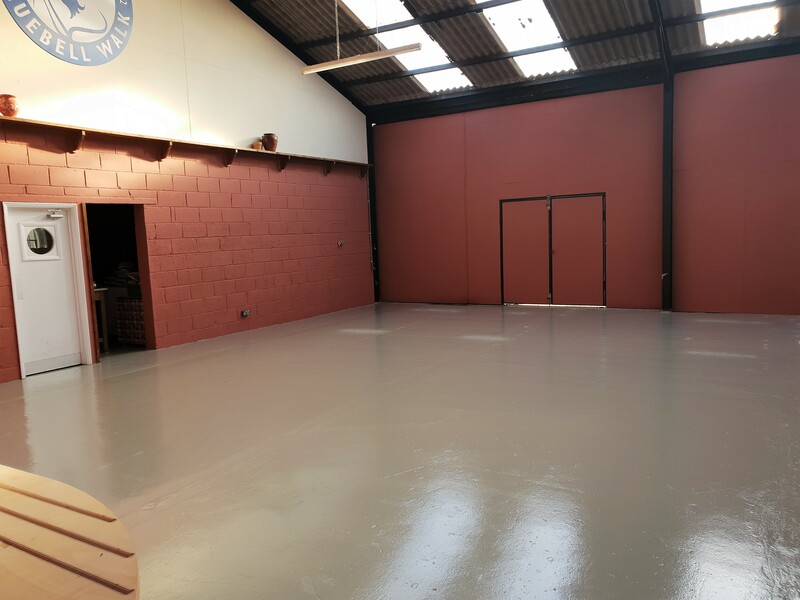 We have insulated the two large sliding doors and their new surface has been painted, as has the floor area, shown here. This gives us the opportunity to change over the positions of two major stalls without compromising on their selling space. The shelving that was behind the H.O.P.S. stall has been moved to the back of the left-hand sliding door, whilst still leaving room for the RSPB stall at weekends. There will be a marked walkway from the entrance door to the counter, so facilitating wheelchair access and those pushing baby buggies. Two large ceiling fans will slowly circulate the air in the building on those very hot days. Our 2018 Photographic Competition winning entries will be displayed in a new format on the left-hand wall. An extractor fan over the dishwasher has been installed, which will be welcomed by those working in the kitchen area, especially on hot days! My aim is to try and have the next blog posted at the end of March. Sooo looking forward to my annual walk round the woods, the ponds and the lagoon. Going up to the Farm and finishing in the Barn for tea and cake. The heady perfume of the wild garlic the blue haze of the swathes of Bluebells encroaching on the white anemones. Proceeds to various charities. What`s not to love about The Bluebell Walk. See you there!!! Around 3-4 years ago when I first discovered your beautiful space, I left a donation and message for an entry into your Memorial book in memory of my dear husband, to be inscribed the following year. The following year I visited & looked forward to seeing the entry, but the book was no longer there. I made enquiries but no-one could enlighten me as to what had happened to the book.I would very much like to know please.